Out of focus photos will soon be a thing of the past, judging by two new digital camera technologies unveiled last week. First up is the Lytro digital camera. Rather than take a photograph by capturing just the colour and intensity as individual points where beams of light strike a flat digital sensor (or piece of film, with a traditional camera), the Lytro captures the ‘light field’ — the amount of light travelling in every direction through every point in space in the particular shot. You can read more about the science at the Lytro web site, but the practical difference for photography is that the resulting image can be refocused after they’ve been shot to emphasise any plane and even converted into a pseudo-3D image. So, if you’ve mistakenly focused on the background of a scene rather than a person in the foreground, one mouse click is all it takes to fix it. It’s easier to the Lytro camera in action than it is to explain what it does though, and you can dabble with a selection of images at the Lytro website. Better still, this technology isn’t just theoretical and the Lytro camera is on sale now in the US. Prices start at $399 (around £250) for an 8GB/350-shot model, but since orders won’t start shipping until early next year, we won’t know for sure how the unusual telescope-like design fares in the world. If you don’t fancy splashing out on a new digital camera as an insurance policy against poorly taken photos, then Adobe will soon let you perform similar tricks on any digital image. 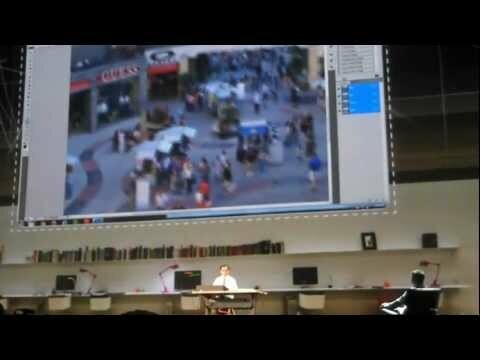 Adobe recently demonstrated its image deblurring technology at a conference in the US and although the technology is still at the prototype stage, it’s already capable of some impressive results. There’s still work to be done before image debarring pops up in Adobe’s heavyweight image-editing application, Photoshop, though — not least since it can only copy with one type of blur at the moment. Add two to the mix, such as camera shake and motion blur, and it struggles to improve things.